It is springtime in New England. Today the sky was crystal blue. The air had just enough bite to remind me of our long hard winter but enough warmth to whet my appetite for the coming sun. This is the time of year when I start to have trout dreams. Sometimes a trout dream has me in tranquil scene. Waist high in one of my favorite Western Massachusetts rivers, casting dry flies to rising rainbows. Other times I am fighting a massive steel head in New York’s beautiful Adirondack Mountains. The water on the surface is always moving faster than the water on the bottom. The bottom of the river is home to boulders, fallen trees and other natural and unnatural hurdles which slow the undercurrent down. The surface has no hurdles. It just flows swiftly by. 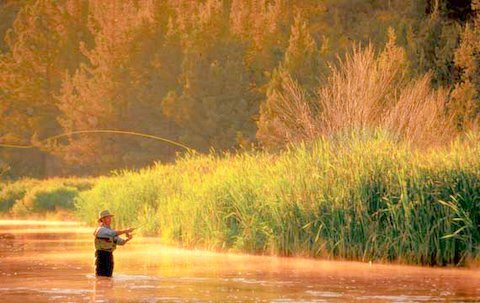 It’s what we see as we stand on the bank, and the picture perfect image that we fly fishermen hold dear. Is your life a bit like a river? The surface looks like smoooooooth sailing. Fast and furious, making it’s way along it’s path. I have my fallen trees. And I am thankful for them. I’m thankful for them because they cause me to slow down. I’m thankful because they point me to the deepest places. In going deep, I learn to wade with greater care and precision the twists and turns of my life, my heart and my feelings. Exploring and embracing our inner worlds may indeed feel slippery and at times unsure but it is worth going deep if the current brings us closer to that life.